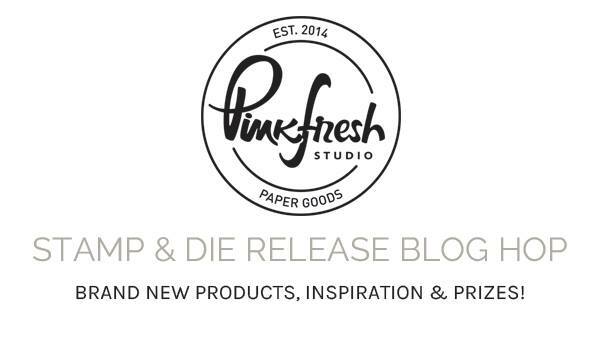 Welcome to the Pinkfresh Studio Blog Hop! 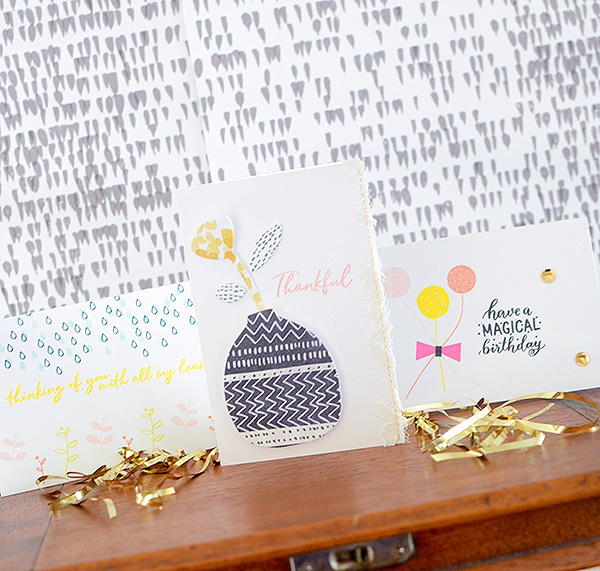 The Cards Team is showcasing all kinds of new stamps and dies so you're definitely in for some fun today! 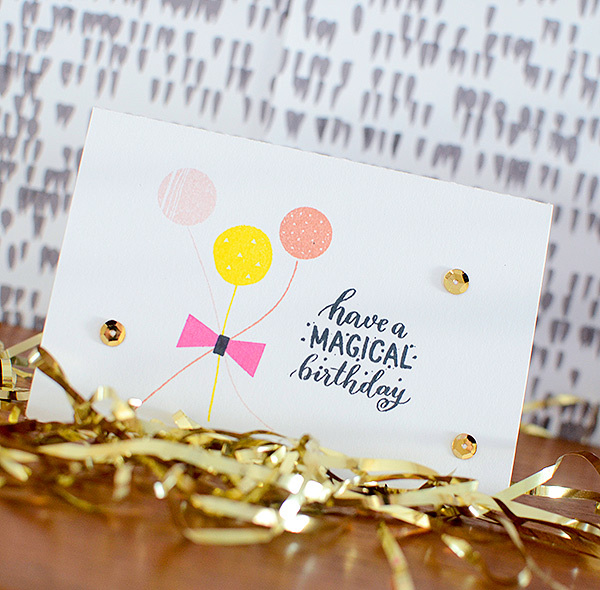 You should have arrived from the lovely Amy Tsuruta's blog and she always has awesome projects to share. After me, you'll be heading to May Sukyong Park's corner. 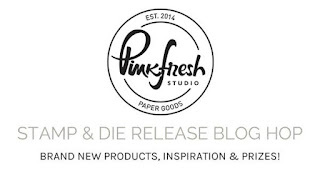 If you get lost during the hop, just head back to the Pinkfresh blog and find your way again. I have a trio of cards for all different occasions. While I plan to send each of these cards out to friends, I thought that the set could also be a useful gift. The cards weren't terribly time-consuming to create so I can definitely make up a few batches for giving. I can't give away these cards as a set without some cute packaging, though! I stamped a little scene on a 4" x 6" muslin bag. "Happy Everything" was the perfect stamp to convey all the occasions of the cards. 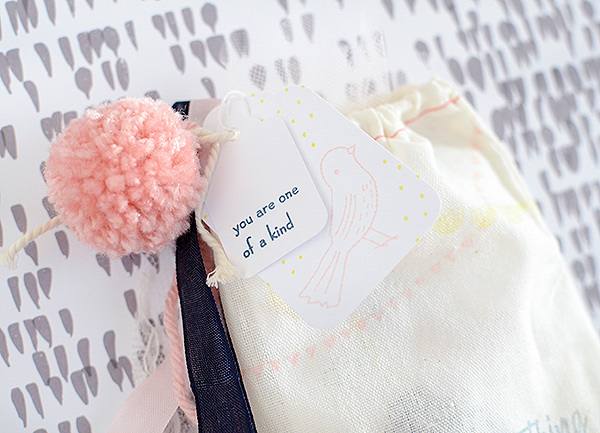 Next up, 2 little tags: the bottom tag features a birdie and some dots from the Bird With Flowers set, and the smaller tag says "you are one of a kind." The final touches were some matching trims and a yarn pom pom. Onto the cards--let's begin with something celebratory! I used a couple of different stamp sets to create a balloon bouquet--Birds & Bows and Tealightful Day. I was able to turn a flower stem from the set Bird With Flowers into a balloon string, too! I then built a bow in pink and black inks, also from the Birds & Bows set. My sentiment came from Inna Moreva's Magical Unicorn (her lettering is so beautiful!). I added some gold sequins to punch up the festive feeling a little and add some sparkle. On the next card, I only used one stamp, but I incorporated patterned papers and die cuts to create a scene and I'm really happy with the way it turned out. My papers are from Escape the Ordinary (Dare, Transform, & Chase). I used dies that coordinate with Susan Driscoll's Fleur 2 stamp set. 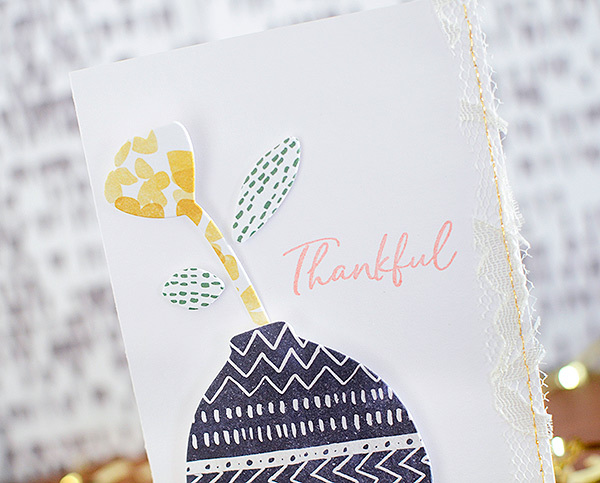 The "thankful" stamp can be found in the Word Series: Thanks set. 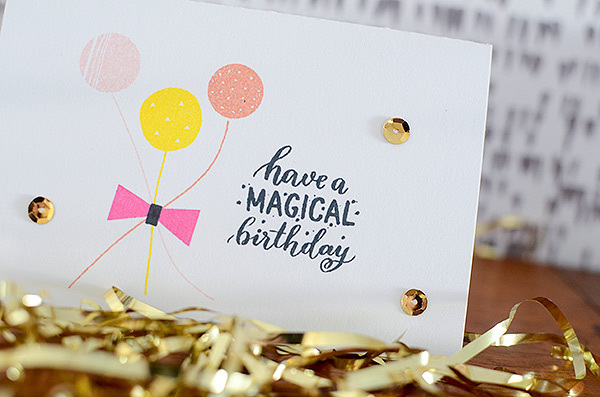 The finishing touch is a little lace hand-stitched to the edge of card. The last card is all stamping. This card is for a family friend going through a difficult time. 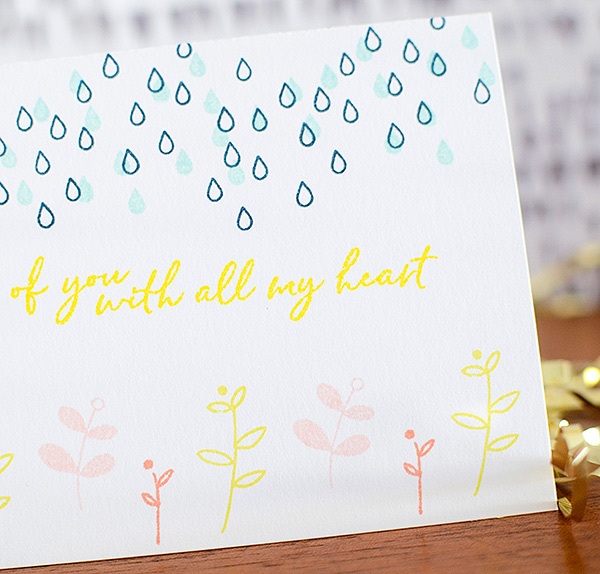 The idea here is that the raindrops (symbolizing her rough patch) at the top of the card are stopped by the heartfelt sentiment in the middle of the card. And below that, a subdued floral pattern. The sentiment and flowers offer hope for better times, or at the very least, her knowing I am here with a shoulder when she needs it so she can get through the difficult time. There are so many options for stamps and dies in this release! 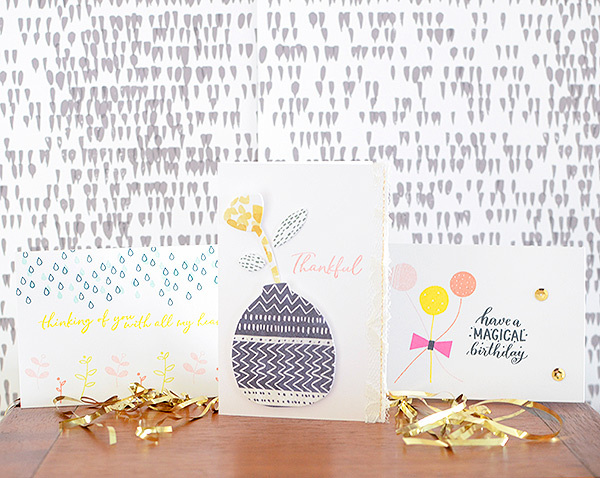 I've shown you a few ideas for different occasions--even making a gift set out of all 3 cards! Your next stop is May Sukyong Park and she is an absolute stamping genius! Don't rush off too quick, though...I have to tell you about the contest! Simply leave a comment at each stop on the hop and you may be 1 of 4 lucky folks who will receive a $25.00 gift certificate to the Pinkfresh Studio store! That's right--FOUR winners! Comments close at 11:59 PM CST on February 8, 2018. 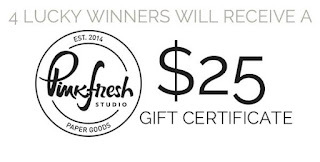 Winner will be announced on the Pinkfresh Studio blog on February 10th. Good luck and thanks so much for stopping by! Rebecca, your cards are beautiful, as always! aagghh I love everything you make! I LOVE that you decorated the bag... so perfect! Those cards are just too fun! these are so beautiful!! you are so talented! An incredible release, filled with wonderfully versatile products to cover ever so many occasions. Your gift ensembles are fabulous: thoughtful and delightful! Lucky friends receiving these packages of joy! WOW WOW WOW all of your cards are beautiful, but the last card really spoke to me with all the thought you put into it. Thank you for the inspiration. What a fabulous card set!!! And I absolutely LOVE the packaging you created for it! So perfect!!! The edge of that one card..wow! So pretty. And unique. Lovely...great job! I love these! This release just lends itself to so many different kinds of card designs. Love the bags for your cards, very creative. All are beautiful but that bag...gorgeous! I like the clean and sweet style of your cards. TFS ! Love the bag...your thoughtfulness on these cards are well protrayed. Your cards are just delightful! Love the bit of lace on the one card; very sweet touch. What a fantastic set of cards and an awesome way to gift them to someone. Cute trio of cards and love the packaging. Beautiful card set and the muslin gift bag is such pretty packaging too! Sweet cards and gift bag! Lovin' this awesome release! You have such unique style, lovely work! Beautiful projects! Such a pretty variety of new products. Love your style.. I always a big fan of pink fresh paper and you just mad a pretty background like the premaid ones.. love the card and the project so much such an enjoying post.. This is such an amazing release! I love your raindrops card! Beautiful cards! I love the pattern on the vase! Wonderful projects! 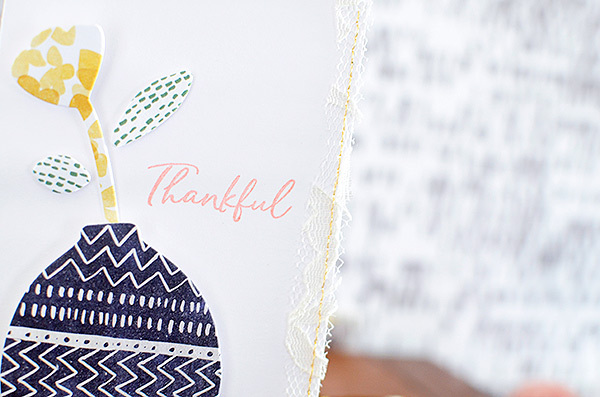 I love the muslin bags and that die cut card, love the papers you chose for that! these are so pretty!! 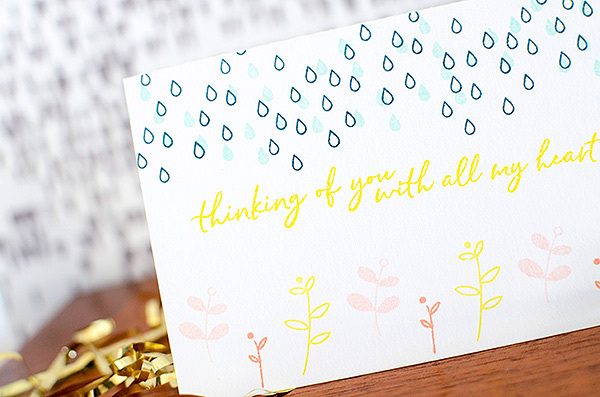 i love the sweet message on the last card with the rain drops and flowers. Enjoy your take on the new releases! So fresh and modern! Love your creative ideas. What a great release. I love your projects! I may be in trouble!! Wow!! Awesome stamped bag!! Love the cards too!! 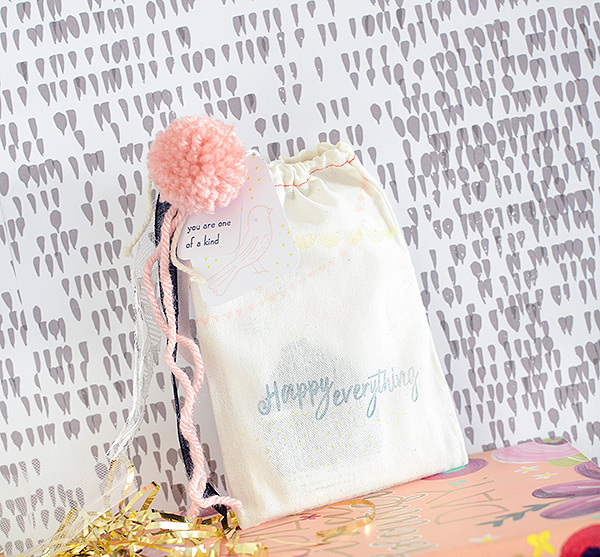 I love those cute pom poms! Really cute design! your projects are absolutely lovely!! So many nifty projects! Love the bag!! All so pretty and sweet! Love them! Beautiful cards!! The color palette you used is so soothing and refreshing. 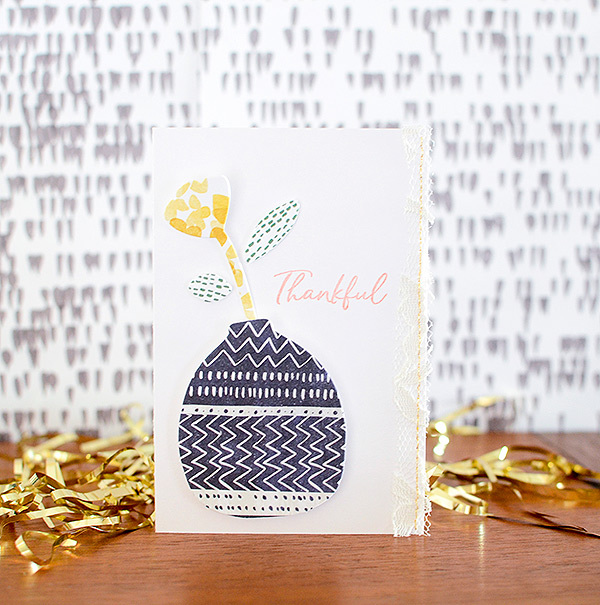 Love the thinking of you card and how you designed it. Beautiful projedcts, love these new products!!!! The packaging idea is super. Compliments. 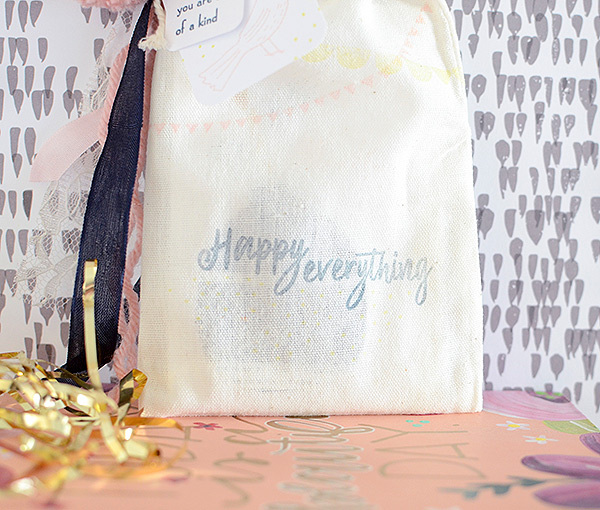 I am totally in love with this whole range and your cards are adorable, love the idea of stamping on a Muslin bag - what type of ink did you use please? This is all so prett You! I love the matching bag! Great cards! I especially like the Thinking of You with all my Heart card and the bag. Fabulous! Super cute! Love the bags! Lovely cards and gift sack! 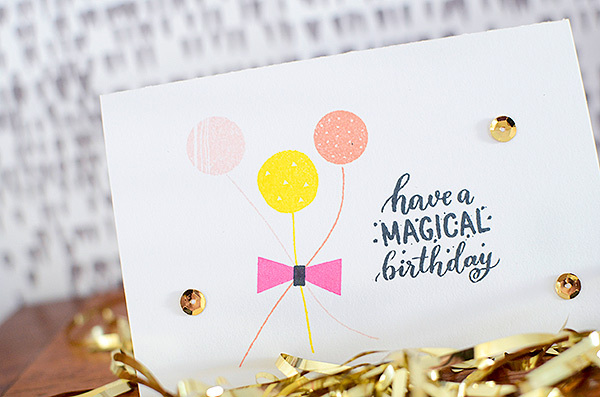 I love your cards and gift sack using these sweet and whimsical stamps! 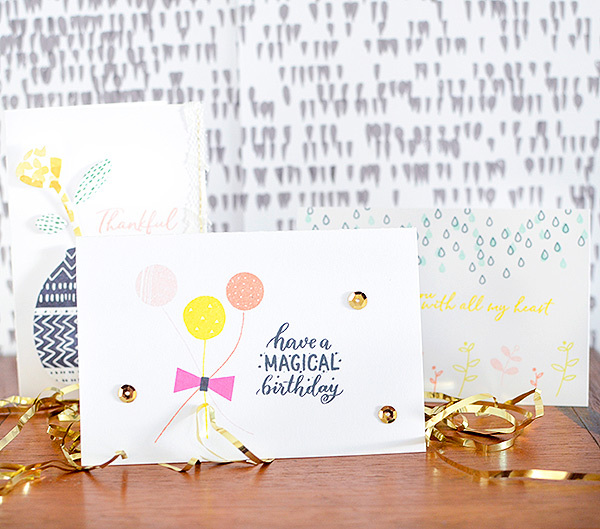 Such pretty cards...so fresh and contemporary looking. Hello Rebecca, After being a long-time follower on instagram, I'm happy to be here! I absolutely love your style of packaging! And that patterned paper vase is amazing! 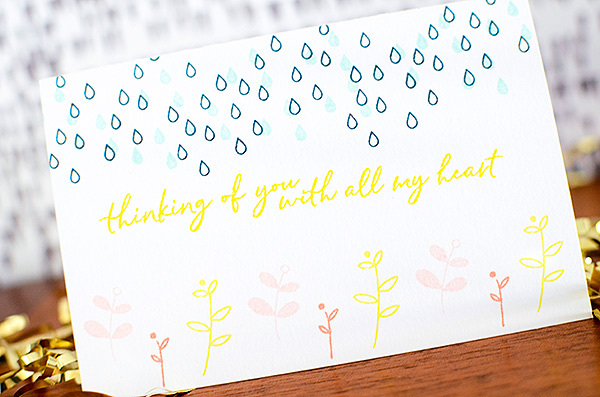 My utmost favorite is the "thinking of you with all my heart" - what a great sentiment, and I'm sure your friend's spirits will be lifted by knowing you made this card - with heart! All your cards are lovely, but I like the encouragement card the best. I think it's a unique and novel way to put together the stamps, but it works really well. I hope things go better for your friend soon, and thanks for sharing with us! Your creations are beautiful and so unique ! Wow, love your cards and the vase is so eclectic! CAS cards are sometimes all you need and these are wonderful! I love the bag you made. Together they are a beautiful gift. Thanks for sharing!